Hey, if there's one thing we know how to do in D.C., it's air our grievances. So with the beloved season of Festivus upon us, here are a few ways to show your (lack of) spirits. The third annual Airing of Grievances in Adams Morgan kicks off this Saturday with NBC Washington's very own Tom Sherwood acting as town crier at 1 p.m. The bulletin board at Adams Mill and Columbia roads N.W. becomes a Festivus Pole, and everyone's invited to share their own versions of Passive-Agressive Notes. And "throughout each day's airing of grievances" -- says the Adams Morgan Business Improvement District -- "there will be a presentation of feats of strength." In response, the Prince of Petworth writes, "All I have to say regarding the feats of strength is -- you're a dead man, Mr. Sherwood. You might want to leave your tie at home. I'll see you Saturday." Eep! However, we have it on good authority (i.e., from Sherwood himself) that for last year's Feats of Strength, he did 25 pushups. "This year, I'll leave it to others," he said. Got that, Prince of Petworth? Old Glory (3139 M St. N.W.) is serving "a menu of traditional Festivus dishes" through Dec. 23. Goodies include meatloaf with mashed potatoes, gravy and green beans, and chocolate cake decorated with M&Ms. Drink specials include Festivus Punch and the Kramer. Gather 'round their aluminum pole, and post your grievances here, too. 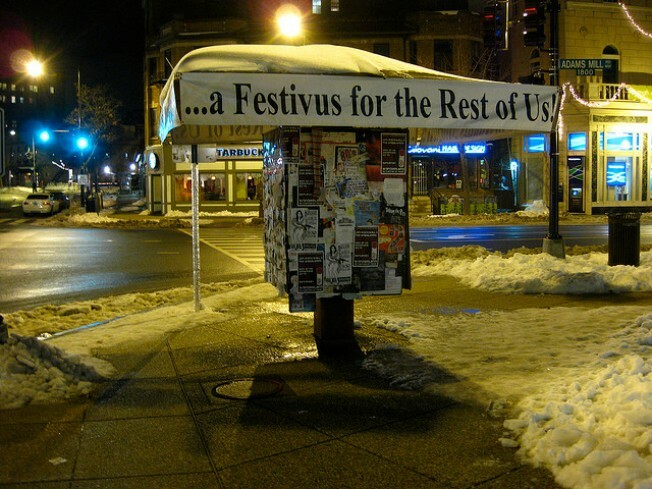 AirTran is running a "Festivus For the Rest of Us" airfare sale through Sunday, Dec. 12. Specials vary, but Tuesday's include $79 to Atlanta and $74 to Raleigh/Durham, both from either Dulles or National, good for travel from Jan. 5 through Feb. 16. Rustico (827 Slaters Lane, Alexandria and 4075 Wilson Blvd., Arlington) throws a Festivus 2010 bash for beer lovers at both locations Wednesday, Dec. 15 from 6 to 9 p.m., which "means two things: an evening of brewed euphoria and ridiculous outpouring of holiday revelry." Alexandria's pours include Tröegs Mad Elf and Bell's Christmas Ale. In Arlington, offerings include Schlafly Christmas Ale and Aecht Schlenkerla Oak Smoke. ThinkGeekwas offering a free Festivus shirt with purchase, but they're already out of them. Maybe this is something you could air a grievance about.